SDSI Springboard Class 11 is Underway! Congratulations to our Class 11 companies, we look forward to watching your progress unfold. StrengthPortal - Personal training management software for gyms that helps track workouts, retain clients and increase revenue. This SaaS platform replaces antiquated and ineffective systems that most gyms are using for personal training. The StrengthPortal system is already in use in multiple gyms across the country, including Equinox fitness locations. Street Swings – Fun, interactive golf experiences that come to you! Street Swings is an experiential marketing company offering highly customizable experiences for all types of events. With customers like Qualcomm, SDG&E, and the attention of the golf market, Street Swings is poised for growth in golf and beyond! Wearbands - Wearbands is a patented resistance band training system the gives you the freedom to perform any movement at any speed, anywhere, under full-time, no-impact resistance. With sponsored athletes that include Olympians, NFL players, Endurance athletes and more, the Wearbands mantra is: You choose the workout, WearBands makes it more productive. Victorise - Data is everywhere we look, but it takes “smart” technology to be able to use it, learn from it. Victorise gives its user the information he or she needs when the user needs it most by leveraging app enabled hardware is unobtrusive and race ready. Prepare to become faster than ever with Victorise! Springboard Grad BLDG Active, brings 20+ year pro mountain bike legend Brian Lopes onto the team! “Scrapes and cuts from bush whacking or a crash here and there, are part of riding – how quickly they heal is key in getting back into the fun,” Lopes said. “Active Skin Repair goes on any scrapes or cuts as soon as I come off my bike and I’ve noticed a huge difference in healing time,” he added. Read the full press release. Join Connor Baxter, Suzie Cooney and other top SUP athletes for a dream getaway on the North Shore of Maui. This event features four days of paddling instruction (for any level) from the best teachers on the planet, surf, fitness, yoga, healthy island food, a luxurious private room at the Lumeria Maui, and more… If only we could swing a “team-building” trip for SDSI employees from April 23-28th… Learn more and sign up soon. Smooth transition from SUP (above) to SUB… The new Stand Up Bike (SUB) is not only a ton of fun, but a great work out as well - burning about 33% more calories than that of a traditional bicycle. Want to test one out, swing on by SDSI and take ours out for a spin – we have thoroughly tested ours this week with lunch/coffee runs and just about every trip results in someone saying “whoa, that’s cool, where can I get one?” Read the Robb Report article, press release, or order yours today! Looking for a great way to build company moral and unity? Want a little healthy competition? Look no further than America’s Finest Corporate Dash 5k! Last year, we had a number of SDSI companies participate and this is always one of San Diego Running Co.’s most heavily attended events – take a look at the 2017 recap video. Assemble your team and sign up soon - price increases next week! With over 500 presenting companies, 65+ private companies, 18 panels, and 4,700 attendees, it is safe to say that the 30th Annual ROTH Capital Conference was another great success! Additionally, the conference continued it’s focus on supporting Challenged Athletes Foundation (CAF) with the annual ROTH Ride, Yoga, Tennis Tournament and more. So far, these activities have raised over $980,000 for CAF! Read the recap on Shop-eat-surf or take a look at the event photo album. ASN (part of TEN: The Enthusiast Network) will be launching an outdoor sports streaming video option to outdoor sports enthusiasts. “Audiences will be able to engage in more of their favorite adventure sports by watching hours of high-quality video content through the ASN mobile app or streaming devices such as Apple TV and Roku. 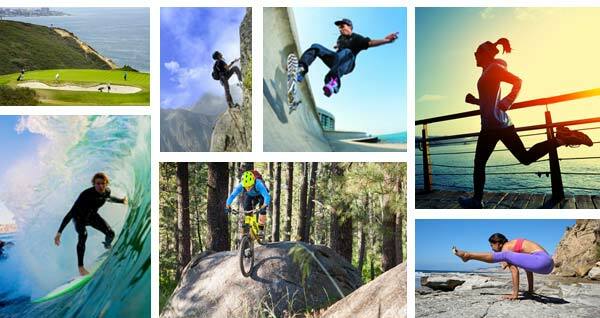 ASN on the OTT platform is for sports and outdoor enthusiasts in search of uncrowded surfing waves, camping sites, hiking trails, or simply those who wish to experience other wild adventures.” Read the full press release. Team USA’s female athletes drove more social media interactions per athlete than their male counterparts. While Shaun White had the most engagements, he was the only male in the top 4. There is also the case study of Brazilian skateboarder, Leticia Bufoni, bringing in $2.5M worth of social media engagements for Nike. Expect her to have a lot more negotiating power when it comes to renew her contract! And we have hookit to thank for quantifying that data. Read the whole article on Forbes. Steve and Angela Watts are featured on Mark Cuban Presents opening the 4 minute episode with the Steve’s wise words of “I just figured you started a company, sell some stuff, and like get rich.” View the whole episode on Facebook Watch to hear thier company story and what has been successful for Slyde Handboards. Springboard Grad Jessica Dallas talks with UC Irvine about what led to her decision to pursue dual degrees - law and business. While already at Law School and going through SDSI Springboard, Jessica told UCI “It was my experience co-founding and growing a business, however, that showed me the value of this type of knowledge and the power it has in the practice of law. For these reasons, pursuing a concurrent degree in business and law seemed like a natural progression for my career.” For more on IPPOS, visit their website or read the full interview if you want to feel like an underachiever. We are approaching the final stages of the process to create a Special Interest California License Plate featuring The Endless Summer theme to benefit the Surfing Heritage and Culture Center (SHACC) led by SDSI mentor, Glenn Brumage. To proceed to the next step, SHACC must pre-register 7,500 applicants for this special edition plate. For more info, visit the website or pre-register.